Welcome to La Casa Ouzeria Restaurant! Jackie Portalakis emigrated in 1973 from the beautiful Island of Crete, Greece to Penticton. It was here in Penticton where they raised their three children, Kosta, Minas and Eftalia. 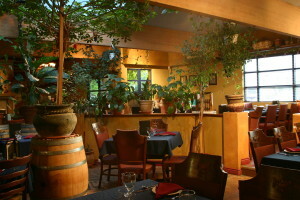 As a family, in 1996 they opened the small quaint, cozy restaurant La Casa Ouzeria. With the support of many and a very loyal clientele they are excited to expand La Casa Ouzeria to their new location, 1090 Main Street. La Casa Ouzeria is a place where people experience delicious food with rich laughter, where friends get together to enjoy a little or a lot, but most of all it’s a charming Casa filled with life’s pleasures. The Portalakis family offers two types of fine cuisine, Greek & Italian. By specializing in traditional homemade dishes, La Casa Ouzeria will provide you with an experience you won’t forget. We invite you to let your mind and taste buds experience the sights and sounds of Europe! If you’re simply looking at taking a step back in time to reminisce about your past travels to Greece then you won’t want to miss a meal at La Casa Ouzeria Restaurant. Our dining room has seating capacity of 110 and invokes the remarkable atmosphere of dining at the Palace of Knossos, Iraklion, Kriti. You have to see it to believe it, but we guarantee you’ll be left in awe at our tribute to one of the most beautiful places on earth. Make a reservation for our indoor dining room or if weather permits enjoy a glass of wine on our 40 seat outdoor patio tonight and experience a feeling of Greece in your own city! 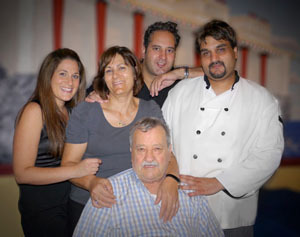 Your hosts the Portalakis Family welcome you to the La Casa Ouzeria Restaurant website! La Casa Ouzeria has been a fixture in Penticton since 1996, providing the best in Greek and Italian Cuisine. Our restaurant exudes a style that is authentic Greek reminiscent of the magical country itself. La Casa Ouzeria is family owned and operated. Our experienced staff radiates a warm, gracious and lively spirit that serves to convey a sense of assurance to fully exceed the expectations of our guests. We invite you take a look around our website and please give us a call, 250-492-9144, to reserve your table tonight! Our goal is to offer traditional food and a style of service that will make you feel welcome and special. We prepare our dishes with sensitivity and care and we hope that your visit to La Casa Ouzeria Restaurant will be a memorable one. The Portalakis Family and Staff thank you for choosing La Casa Ouzeria Restaurant for your dining pleasures; where nobody is a stranger, they just haven’t met yet. Enjoy. OPA!